I’m pleased to announce that Gilda Trillim was selected as the Association of Mormon Letters’ 2017 Novel Award at Friday’s award ceremony. Previously, I posted this for groups wanting to read it, and this award is further evidence that it is worth reading. You are probably thinking that it was selected as the winner because it has rats in the title. Everyone knows, rats sway judges. It was almost unseemly of me putting the word ‘rats’ on the cover of the book. You may think it was a gimmick to get people to buy it and to help it play well on the awards circuit (I, however, deny that it had any role in being nominated as an AML finalist AND a Whitney Award finalist. It was just a coincidence!). Now that it has won the big award, some will likely accuse me of just pandering to the rat loving public. A crass attempt to affect its getting undo attention, but that’s just not the case. The rats in it are not just gratuitous rat-placement. No! Their presence is central to the plot. Well, anyway, here is the full citation for the award. Doesn’t this make you want to read it? Do so. Then get your friends to Partake. What if whatever it was Orson F. Whitney once said about Mormon literature was realized, and we could finally claim someone like a Shakespeare or a Milton of our own? And what if that writer was, for the most part, made more of a William Blake than a William Wordsworth, more of a James Joyce than a Jane Austen? This is the title character of Steven L. Peck’s Gilda Trillim: Shepherdess of Rats. She is brought to life through Peck’s skill as a writer and thinker, and through his audacity—challenging and provoking the reader in strange, original ways. Rich and unexpected, the novel explores universal themes of grace, love, sacrifice as well as universal questions about the mind and body, free will, and how anything is known–including and the reality and nature of god. This is achieved through the well-wrought interplay of poetry, philosophy, narrative, and the artful posing of the same devastating questions we have all asked ourselves. Gilda Trillim has already been called “a milestone of Mormon literature.” This is true not just for its message but for its medium, harnessing the form of the novel to show that imagination can bring us closer to truth. Fiction is a faculty, helping us transcend the limitations of our natural understandings and perceptions. 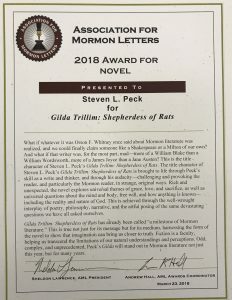 Odd, complex, and unprecedented, Peck’s Gilda will stand out in Mormon literature not just this year, but for many years. You can get a copy here. There is also a great review in the newest (Spring) issue of Dialogue. Glad to see your work get the recognition it deserves, Steve. I love you to pieces, Steve. The award is well deserved!